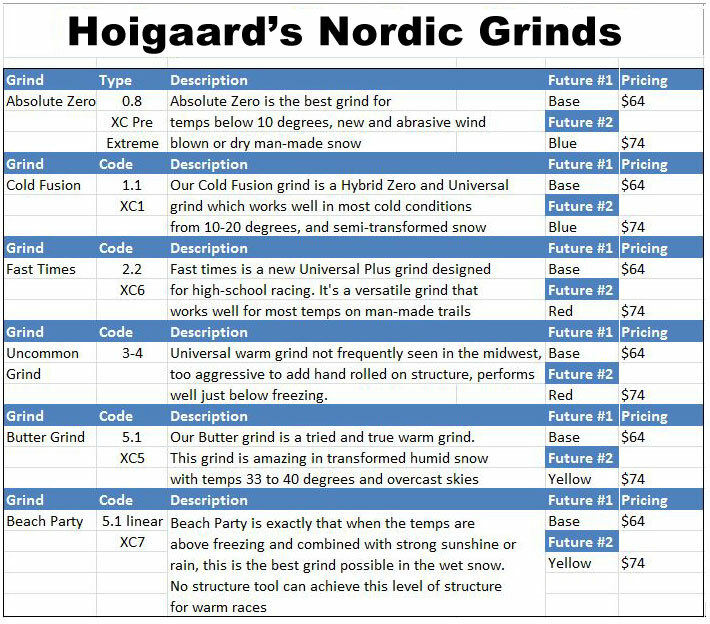 Nordic Wax & Base Grinds - Hoigaard's - Skis, Snowboards, Bikes, Paddlesports, Camping, Apparel, Footwear, & more! Left your skis in the bag after that last spring ski? Chances are your skis are dried out from summer storage and could use a refresh in our Wax Future machine. We start by cleaning up your skis and then iron in base wax, then saturate using our Wax Future machine. The Wax Future machine is an infrared application rather than a Hot Box treatment. Recently many ski manufacturers are recommending against hot boxing as a way to saturate bases as it compromises the integrity of the ski construction. The Wax Future is the best way to saturate your bases without multiple ironed-in applications, so you are ready to race! Single Pass: $20 - Single wax application, infra-red treatment, scrape and brush. Complete saturation with hydrocarbon wax of choice. Double Pass: $30 - Double wax application. Base wax applied, infra-red treatment, scape and brush followed by second wax of your choice, second infra-red treatment, scrape and brush. Drop your skis off at Hoigaard's and we will treat them to our Five Star Wax Service in preparation for your next race. We stock the wax, tools and expertise necessary to prepare great gliding skis. Relax and let us do the work! You can choose from our Bronze, Silver or Gold options, based on the level of fluorocarbon wax you desire. We start with a low fluoro base saturation using our Wax Future machine. Next we iron in the appropriate fluorocarbon wax and finish with a hand structure for the best possible glide on race day! Hand Structure for your fastest skis on race day! There are three critical factors which contribute to fast skis: ski flex, wax and base structure. Our Nordic experts at Hoigaard’s can help you with each of these components, even if you are simply looking to ski for fitness and fun. The popular misconception is that it's all about wax, however structure is the most important component in making a ski fast, assuming you've selected the right ski for the conditions. With high-flouro waxes on the way out (especially for high school racing) the structure you select is critical. Most new skis have a warm aggressive European structure right off of the rack, that isn't always well matched to our northern climes. We have expanded our stone grind offerings to reflect conditions you will face in the Midwest; cold, humid, machine-made and abrasive snow conditions. For the skier that only has 1 pair to race on, we've developed a new grind which will perform well in most conditions and especially machine-made snow…we call it “Fast Times”! If you are in the store, ask us how we selected the name. We have made a significant investment in our stone-grinding capability with the purchase of our Wintersteiger Mercury as well as the R & D and knowledge in our back Nordic shop to better understand how our grinds perform out on the trails. We have a full fleet of test skis which our employees ski on at various locations to better advise you on stone grinding and wax selection for current conditions. We are “tuned-in” to ski conditions as many of our employees both coach and race and we also leverage our Hoigaard’s Nordic Racing team ambassadors to test skis, grinds and waxes on our behalf. We’ve ground and waxed skis for Juniors all the way to D1 Collegiate skiers and top Birke finishers. Our Wintersteiger is fool proof. We use some pre-programmed grinds and have also developed 6 proven grinds of our own that are verified and proven for success. You can choose from two grinding options, based on the level of base-prep wax you desire; Grind and single Wax Future or Grind and two-pass Wax Future. The two-pass Wax Future is best as we layer on a ski/temp appropriate base layer so your ski is ready to race wax and go! If you do your own race waxing, the single pass cleans, restores and removes any material left-over from the stone grinding process. When should you stone grind your skis? If you have a single pair of skate or classic skis; you’ll need to choose what the best grind is for universal conditions. Since we see the full spectrum of weather here in the Midwest, this gets really tough. We’ve developed a few grinds that become versatile by simply adding structure as needed when it warms up. You can always add structure to a base using a structure tool, but you cannot remove it from a warm grind when it gets cold. When your skis are aging; they may not either be flat or consistent as far as structure. As skis get old they begin to oxidize (white spots on the base) and a fresh grind will help them perform like new again. When your skis are not flat; typically new skis are not perfectly flat or older skis that have worn edges will not be flat. Over time through skiing and waxing, skis can develop convexed or concaved spots which slow a ski down. If your base is seared from excess heat; a condition that occurs when your waxing iron is too hot or held in one spot too long. Wax applications will not last long on a seared base, the base will look white or grey in spots. When you have a fleet of skis; it’s important to take inventory of what you have, how each pair flexes, and what conditions they will ski fast in to help you determine the type of grind to apply. This is key for advanced high-school racers, Elite Junior racers, Collegiate racers or Master Blasters with a fleet of skis. Bring them in and we will help you determine flex and structure to reduce confusion on ski choice. HS Blue or Red applied with iron, scraped and brushed. For classic skis; removes old kick wax and irons in hydrocarbon “wax of the day”.